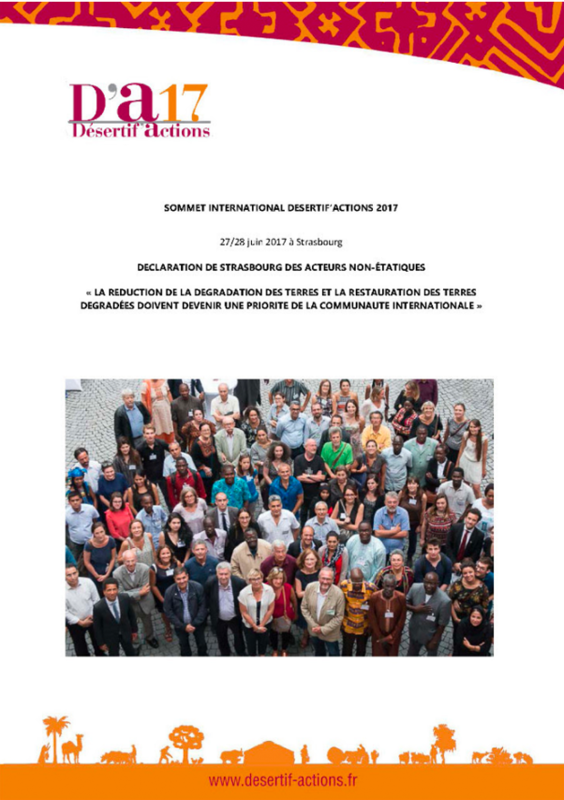 In the follow up of the International Summit of non-state actors on land degradation and climate change in local territories “Désertif’actions”, held in Strasbourg on 27 and 28 June 2017, hosted by Roland Ries, Mayor of Strasbourg and Co-President of UCLG, in partnership with the United Nations Convention to Combat Desertification and the Climate Chance association, please find related communication below including the Declaration issued at the end of the Summit, that you are invited to sign. The Desertif'actions Summit has just ended. It has been the first multi-stakeholder event to bring together the non-state actors involved in the issue of the UN Convention to Combat Desertification. The Summit gathered 200 participants from thirty countries and gave to them the unique opportunity to discuss, to confront their views, to develop a long term dialogue between the communities of actors in the fight against land degradation and climate change. 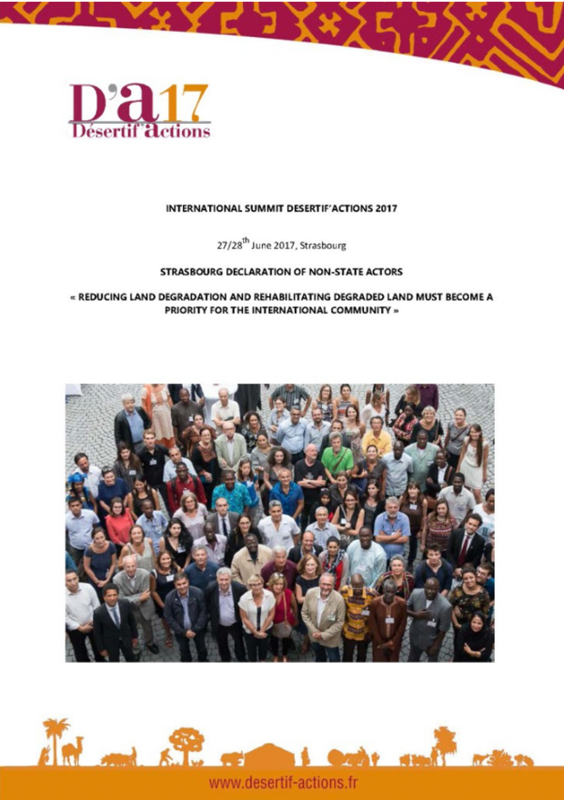 The Strasbourg declaration issued at the end of the Summit was unanimously adopted at the closing plenary on Wednesday 28 June and is already supported by l'AFPAT - Association des Femmes Peules Autochtones du Tchad, la voûte nubienne, Enda Energy, WECF, la Fondation France libertés and UCLG. Land and climate: taking action is now possible. This declaration draws the roadmap and sets the priorities of non-state actors. It will be presented at the United Nations Convention to Combat Desertification in Ordos, China (COP13) in September, and at the United Nations Framework Convention on Climate Change taking place in Bonn, Germany (COP23) this November. Following its objective to develop a multi-stakeholder dialogue on all issues related to climate change, the Climate Chance Association has been involved in the organization of the Da17 Summit and gives the opportunity to all of its COS member organizations to support this declaration by signing it and relaying it in their networks. Therefore, please send us an email to association@climatechance.fr by August 31st to indicate the name of your structure as well as the contact of your focal point. This Declaration is the only one to bring a common voice of the non-state actors in both issues (land degradation and climate change). It goes without saying that the more and diverse signatures we get, the more strength this Declaration will have during its presentation at the two UN Conferences.